Peak Period Short Service 307P is a Peak Period Short Service (PPSS) from Choa Chu Kang MRT and looping at Choa Chu Kang Street 62, passing through Choa Chu Kang Drive, North 5, and Yew Tee MRT. Operating during weekday peak hours, it runs alongside Intratown 307 and alleviates crowding on high-demand sectors during periods of high demand. 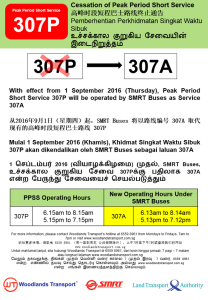 Peak Period Short Service 307P will be replaced by SMRT Shortworking Trip 307A and withdrawn from 01 Sep 2016. Service 307P duplicates the North Loop of Intratown 307, serving between Choa Chu Kang MRT with Choa Chu Kang Neighbourhoods 6 and 7. Operated using private coaches from Woodlands Transport, the route helps to relieve frequent overcrowding on Service 307. It is the 9th PPSS service to be introduced. 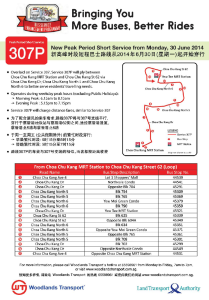 Despite duplicating 307, this service does not serve Choa Chu Kang Interchange. 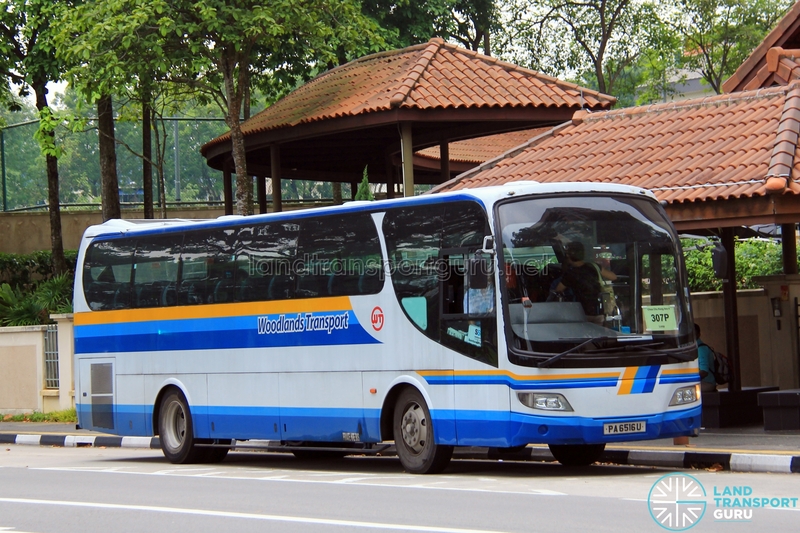 With the transition to the Bus Contracting Model (GCM), PPSS 307P was renumbered as Shortworking Trip 307A and operated by SMRT Buses from 1 Sep 2016. More information at Changes to PPSS. 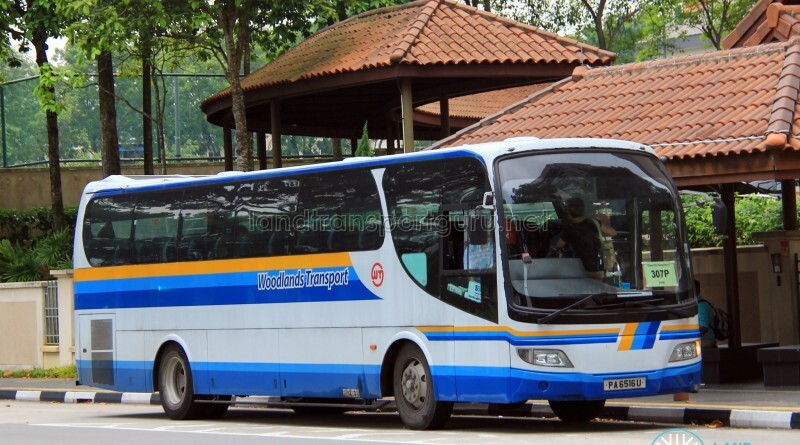 Fleet: Service 307P′s fleet fully comprises of private coaches from Woodlands Transport Service Pte Ltd.
2014 (30 Jun): Introduced as a PPSS route from Choa Chu Kang MRT and looping at Choa Chu Kang St 62 under the BSEP. The contract for Peak Period Short Services lasts for 2 years and was renewed from June 2016 to August 2016 .